No Man’s Sky is here, and with it comes 18 quintillion planets of plants, creatures and atmospheres that will try to kill you. But before you can worry about traipsing around the galaxy, you have to survive the very first planet you wind up on — the start of the game. You’ll wake up next to your half-ruined ship, marooned on some random alien world, repairing things as fast as you can in order to stay alive. There’s a lot to learn, right out of the gate. 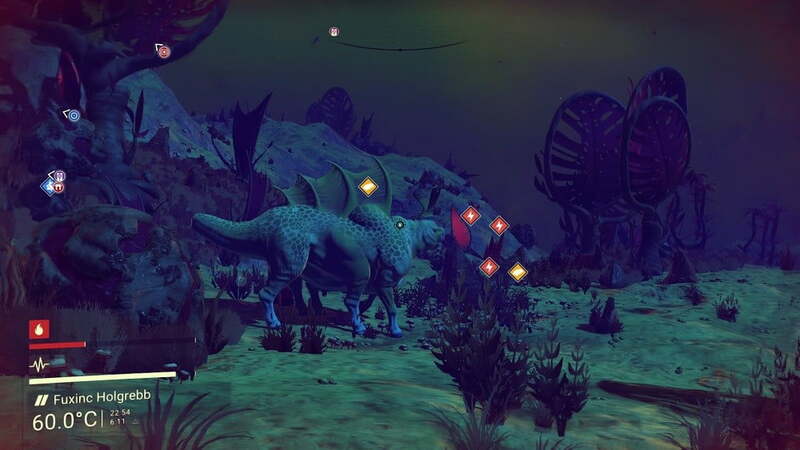 No Man’s Sky isn’t always great about explaining all of its systems. The quicker you get on your feet, the faster you’ll be able start exploring the vast universe developer Hello Games has created. Here are nine things to know that will help you survive and get going that much faster. No Man’s Sky is much more Minecraft than it is Destiny. As you explore planets and make your way toward the center of the galaxy to meet the endgame, most of your time will be spent gathering resources on planets to build items, upgrade your equipment, and keep your ship fueled. You can craft two kinds of objects: “Technologies,” which you install on your ship, exosuit or “multi-tool” (your gun, basically), and “Products,” which you use to build new stuff. You install techs using the X button and craft with the Square button. Much of No Man’s Sky is about managing the inventory of your suit and your ship, which you can trade things between much of the time. Both inventories are made up of a series of slots, which can either hold objects — materials, items for trade, or various kinds of fuel — or can hold installed tech that improves your gear. You want to increase your inventory size whenever possible, and you also need at least one free inventory slot to craft anything. Long story, short; pick up a lot of stuff, but always be sure you have free space available. You’ll be doing a ton of crafting. Two of the first things you’ll need to repair will be your multi-tool’s scanning abilities. One is a visor you can use to identify plants and animals — get used to scanning everything you encounter, as it pays off later. The second pings the environment to reveal resources near you. That one’s invaluable. Get used to pinging the landscape with L3 (press down on the left control stick) pretty much constantly, as it’ll reveal everything from ship fuel to alien artifacts in your general vicinity. And especially in the first hour, you’ll need to know where the resources that will keep you alive are as you run around trying to repair your ship. If you don’t know how the scanner works — which isn’t immediately obvious — you might find yourself dead before you even get off the ground. The thing about Technologies is that they often have to be charged up with consumable materials, just like your ship has to be continually refueled to keep flying. Your spacesuit has two major systems you need to watch: Life Support and Hazard Protection. Life Support power depletes anytime you’re outside of your ship, and Hazard Protection depletes when the surface of a planet is volatile. They make up the basic survival portion of No Man’s Sky. Keeping your Life Support and Hazard Protection charged is essential if you want to explore beyond the immediate vicinity around your ship. Life support is easy to top off. You can charge it with any red “isotope” material you find in the game, which is plentiful. Your Hazard Protection, on the other hand, recharges when you’re safe in your ship or in a shelter, but can only be recharged with special items, or the minerals Zinc or Titanium. You can find those on most alien planets, but they’re not always plentiful. Zinc always comes in certain yellow planets; Titanium can be stolen from sentinel robots you’ll find patrolling every planet. While away from your ship, though, you might not be able to find what you need for a recharge, and this can be deadly, especially early in the game. So when you do find Zinc, which is pretty common, it’s always a good idea to grab it and keep some on-hand for an emergency. Same goes with Plutonium: anytime you see red crystals, grab some. You’ll use it constantly, but more than that, Plutonium keeps life support running, and that’s what keeps you alive and exploring. Inventory slots are important in No Man’s Sky, but it’s not immediately apparent how to upgrade your junk when you first start out. You can buy new ships and multi-tools, but your exosuit has to be upgraded piece by piece. To do that, you need to seek out Shelters and Colonial Outposts. Shelters are sometimes “Drop Pods,” which are basically small rooms where you can huddle out of the elements for a few minutes and recharge your Hazard Protection. But these places often include exosuit upgrades as well, making them super valuable, especially early on. Find upgrades to carry more gear and install more tech, which will allow you to upgrade your gear a lot more, and make doing just about everything easier. In fact, there are a ton of technologies you can discover all over the place. They’re in buildings, in crashed ships, in drop pods, in smoking ruins of alien tech — and at some point, you might have so many you can’t use right away that you’re tempted to ignore them. Don’t. You’re not going to want to use every upgrade, and you won’t have the room to, but some are worth the effort especially early on. Moving around on foot in No Man’s Sky is painfully slow, so look for upgrades that increase your sprint stamina. Same goes for your jetpack: you’re always going to want as much power in it as you can get (although it allows you to climb walls even when it needs to recharge). The point is, the faster you upgrade things like your mining laser’s power, your sprinting capabilities, and your life support systems, the more quickly you’ll be able to focus on exploring instead of simply gathering rocks to stay alive.